From time to time, we like to play a little. We call it research and development. When these fun little projects turn into something amazing, we release them to the public in very limited quantities. If you see one of these, grab it, because you may never see it again. Most of these projects are 200 bottles or less when released. Roundstone Rye Cask Proof "Maple Finished" – Cask proof Roundstone Rye, finished in a Langdon Wood maple syrup barrel. This one comes around about once a year; it's so popular. Old Tom Style "Peach Barrel" Watershed Gin – Our classic Watershed Gin, which is aged in a Short Hill Mountain peach brandy barrel, and then bottled with 10% sugar. Old Tom Style "Pearousia Barrel" Watershed Gin – Our classic Watershed Gin, which is aged in a Pearousia pear brandy barrel, and then bottled with 10% sugar. More info, here. Día de los Muertos American Malt Whisky – Our collaboration with Adroit Theory Brewing Company, another delicious malt whisky expression. Single Cask Nation Catoctin Creek 2 Year Old – Perhaps the best whisky we've ever produced, a distillery in Scotland guessed that it was an 11 year old whisky. More info, here. Single Cask Nation Catoctin Creek 3 Year Old – Aged in white wine casks and kissed by new oak, this is the oldest whisky we've released to date. More info, here. Roundstone Rye Cask Proof "Brandy Finished" – Our ever-popular cask proof Roundstone Rye, but finished in a Catoctin Creek 1757 Virginia Brandy barrel. 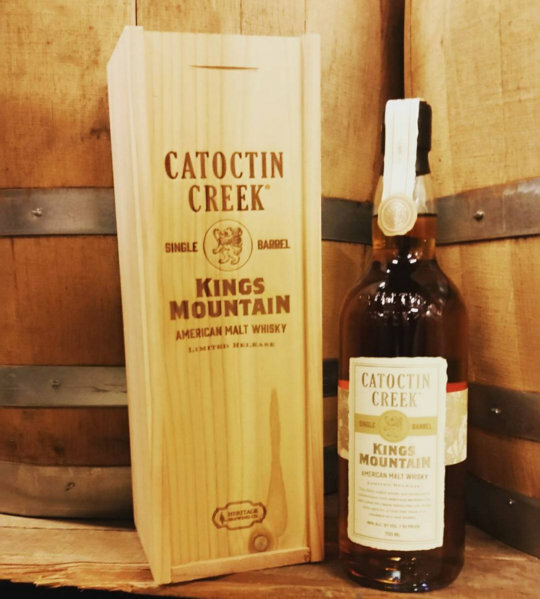 Kings Mountain American Malt Whisky – Our collaboration with Heritage Brewing Company to produce our first malt whisky. Used barrel finishes – Think honey barrel aged, maple barrel aged, hickory syrup barrel aged, pear brandy finished, peach brandy finished, wine finishes... you get the idea. Beer into whisky collaborations – Working with local breweries to produce whiskies distilled from a malted barley mash, both hopped and unhopped.